I work with students from Sacramento State University and currently act as a co-advisor on a number of graduate student projects from other Universities. Hi there! My name is Jessica Schlarbaum and I am from Anaheim, California. I completed a B.S. at UC Davis in Wildlife Conservation Biology in 2016 and am currently an avian science graduate student at UC Davis. After volunteering at the California Raptor Center for four years, I developed a passion for raptor biology, which drove me to be a part of Dr. Hull’s lab. I am currently developing a nestbox project for American Kestrels in Yolo County and the surrounding areas. These little falcons won my heart quickly and I plan to study their population decline for the rest of my career. I am also interested in behavioral ecology, but more specifically how human interaction impacts natural behaviors in raptors. 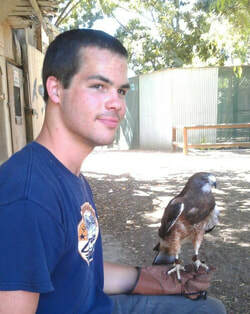 When I’m not spending my time at the California Raptor Center, I love birdwatching, hiking, and spending time with my cat and dog. I am a recent graduate from the Environmental Studies program at CSU Sacramento. My research involved analyzing how birds utilize flood irrigation versus subsurface drip irrigation, and how farmers in turn benefit from having birds present on their farms. I currently work at the United States Geological Survey as an analyst in an organic matter research lab and as a field assistant. I plan on continuing to study Environmental Science in graduate school starting Fall 2018. Hi, my name is Breanna Martinico and I am from San Jose, California. I transferred to the department of Wildlife Fish and Conservation Biology at UC Davis after completing an A.A. degree in the Wildlife Science Technician program at De Anza College. I gravitated towards the field of conservation biology because I am passionate about wildlife and want to work to lessen the negative impacts of humans on biodiversity. I am specifically interested in research focused on avian conservation and ecology. My hobbies are hiking, birding, photography, and taking care of my dogs. Minette and Robbie worked together as undergraduate interns in Winter quarter to collect data on weevil abundance and crop damage in alfalfa fields around Yolo county. Hi! I'm Jeffrey Haight. I'm a 4th year Environmental Science & Management major studying ecology at UC Davis. Though I currently live in Davis, I'm originally from El Sobrante and the nearby cities in the East Bay Area. Through the course of my upbringing and education, I've developed a strong yet very broad interest in conservation ecology. More specifically, I am mainly interested in studying how best to conserve and reconcile biologically-diverse ecosystems in urban and agricultural areas, where people are already present and dominate the system. Ultimately, it is my overarching goal to take my interest in conservation and apply it to the education of others as a teacher at a college or university. When I'm not busy studying ecology, I enjoy playing music, hiking, boating, and generally anything else that gets me outdoors. Sara has helped out on many of our field projects as well as our lab work to dissect barn owl pellets- here she is after discovering a particularly interesting animal inside one of the pellets. Hello! My name is Efraín Delgado and I'm a third year student at UC Davis studying Environmental Science and Management. I grew up Stockton, California which is a short one-hour drive from Davis. As of now, I'd say a lot of my interest is in the relationship between science (environmental and ecological specifically) and the way the wider population values or understands it. Growing up I have seen that science does not have much value within the latino community so the dynamics behind that has always been a topic of interest for me. I also think one of the more important steps in being able to do something about this issue is making myself literate in the world of science so that's why I do my best to increase my exposure to science through things like this research project! One random interest that I have is in astrophysics. I love learning about topics like Time's ability to "rip and repair itself" or the reasoning behind why the universe seems to be expanding as a result of the still precedent effects of the Big Bang. My name is Emily Phillips and I am from Upland, CA. I graduated with my BSc in Conservation Ecology from New Mexico State University in 2015 and am currently a Master's student in the Avian Sciences program at UC Davis. During my time in New Mexico, I worked at the Los Alamos National Laboratory, studying western bluebirds and helping with MAPS Banding stations. I have always loved birds--especially raptors--and with my interest in human impacts on wildlife, I chose to study barn owls in the Central Valley of California. My graduate studies will focus on rodenticide exposure in barn owl chicks in relation to their growth. I will be conducting this research through Dr. Joshua Hull's lab at UC Davis and be collaborating with Dr. Sara Kross to expand the study even more. My research interests lie with conservation and wildlife ecology, human-wildlife conflict and how humans affect ecosystems and top predators. Ryan completed his undergraduate research in my lab on barn owl diets (published in Agriculture, Ecosystems & Environment) and then went on to join Josh Hull's lab as a graduate student at UC Davis. Ryan is currently working with me on developing further research to examine barn owl movements across an agricultural landscape. Erin had just dropped a sampling tray of weevils onto the floor in the lab. She chose this photo! My name is Mayra Pelagio, I am originally from Guanajuato, Mexico and I have been living with my family in San Jose California for the past five years. I am a first year UC Davis student majoring in Environmental Science and Management. I enjoy learning about the environment and ways to prevent further environmental degradation. Some of my hobbies are crocheting, dancing and volunteering for nonprofit organizations such as the American Red Cross. My name is Justin Yuen and I am from Orange, CA. I am a fourth year undergraduate at UC Davis and am majoring in Animal Biology. My career goal is to become a practicing veterinarian. I have keen interest in almost all animals and in my free time love to play musical instruments such as the drums and piano and sports such as basketball and tennis. Maggie, a biology major planning to go into pharmacology, worked in my lab at UC Davis for one semester to get experience working in the field. Sam worked as a student assistant on our projects to quantify bird abundance in agricultural fields, and volunteered to help with analyzing barn owl pellets. I am excited to have had the opportunity to collaborate with a number of amazing scientists. Please contact me if you are interested in future collaborations! Below, I've listed the people I'm currently working with, as well as folks I've worked with in the past and the general area of study we've collaborated on. The Smith Fellows- Projects on the go include analyzing scientific communication and social media, preparing a policy statement, and organizing conference symposia.